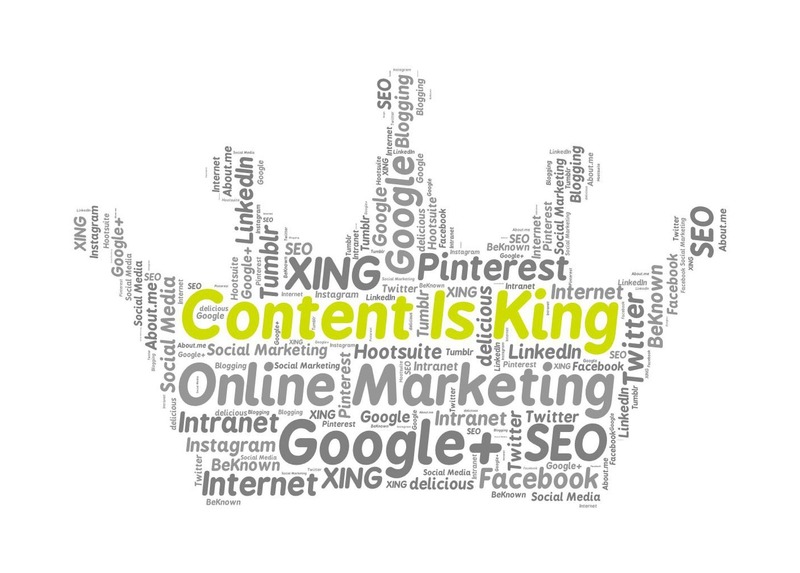 Content marketing: its one of the most essential skills you can have in today’s digital world. You may have heard that content is king- and this is especially true if you’re starting a new business or are a beginner at online marketing. Not only does it help you establish credibility, but it will also drive potential clients to your website and social media profiles. There is a ton of information out there so it can be difficult to determine which tips are best to use for your business’s specific needs. 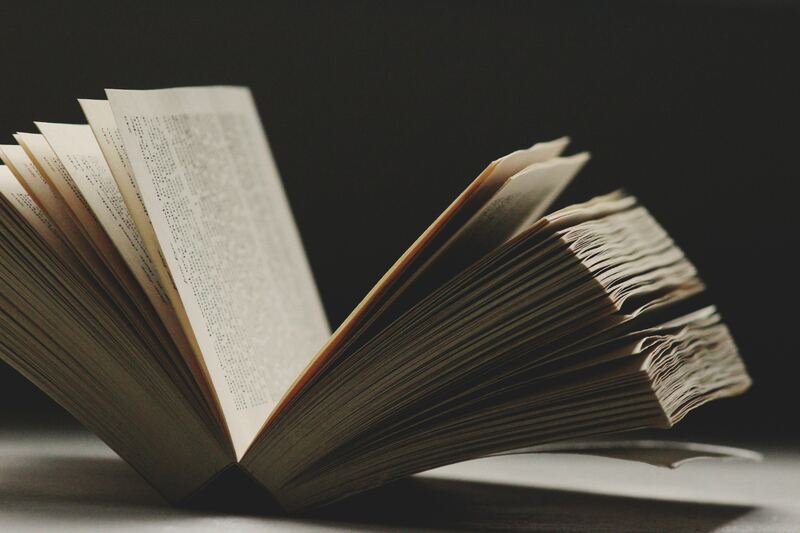 Recently, we dove into a great book and wanted to share some of our key takeaways from Jon Wuebben’s latest book, Content is Currency. Jon is a well-known web content strategist, copywriter, speaker and entrepreneur. He has started two businesses, Custom Copywriting and Content Launch, both of which have a unique approach to creating content for websites, blogs and social media. 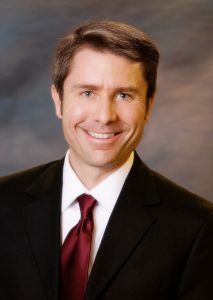 He is also the author of Content Rich: Writing Your Way to Wealth on the Web and teaches entrepreneurship and business classes at MiraCosta and Miramar colleges. For financial advisors, its important to develop content that is both relevant and valuable to clients and prospective clients. Although it can be a large time commitment, creating solid content will boost your online presence and help you connect easily with potential clients, making your business appear more trustworthy. So let’s dive into it! 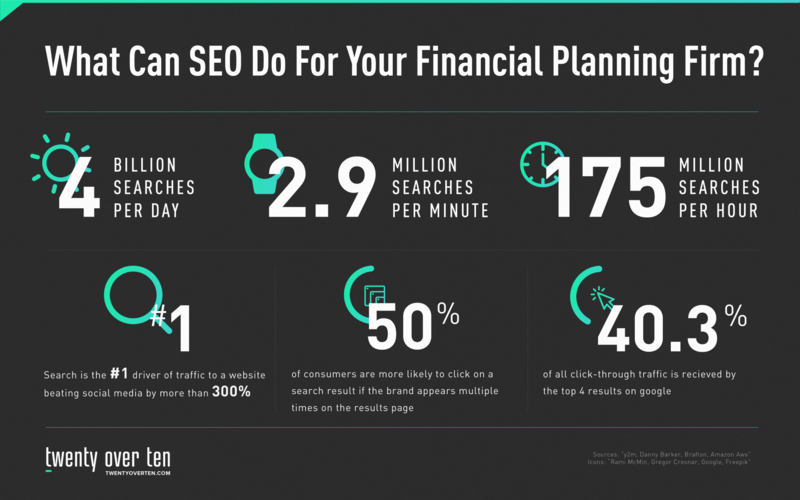 Our overview below focuses specifically on what strategies financial advisors can use to create website, blog and social content that will lead to lifelong clients. Content can be anything from the copy on your website to an educational blog post or email. It can be used to form connections with potential clients and persuade them to take action or be a useful resource for your current clients. As a financial advisor, you should mainly focus on website copy, blog posts, social media presence and email marketing if you have a solid list of subscribers. Currently, about 80 percent of businesses have only limited knowledge about the way web and mobile content could be affecting their business (Weubben 3). While you may think this sounds discouraging, it likely means that your business has a lot of areas for future growth. Building a solid website, blog and social media presence can lead to huge improvements in your company’s marketing. When someone comes to your website, they are looking for a firm they can trust and feel comfortable spending their money with. Having accurate and helpful information is especially important when they are trusting you with something as precious their financial plan. As you put content online, you are contributing to the building of your brand (Weubben 6). A quality brand will help a firm become a leader in their industry and content can be the driving force behind that. It’s important that your brand stays consistent across all channels so that your customers have a solid image of who you are and what they can expect. What you’re doing: As a financial advisor, you should have three basic channels: a website, lead generation (webinars, e-books, etc.) and offsite resources, such as social media. Your website content should also include a blog (Weubben 6). Another example of something that may make your website stand out is positive customer testimonials (Weubben 10). These show that you have good established relationships and can satisfy customers. How you’re doing it: Your blog is key for getting your content out to customers. A good way to achieve this is through a newsletter. If you can get specific target audience subscribing to a newsletter, you’re already building a relationship with them (Weubben 10). You can also spread blog posts through social media channels once you establish some loyal followers. How you support it: Once you start growing your content marketing efforts, you have to make sure you’re maintaining this growth. Set goals for your firm’s marketing efforts (Weubben 11). For example, a good goal could be to produce 10 new blog posts this month or gain 100 new Twitter followers. Just make sure you’re still striving for quality over quantity! Finally, Jon describes some recent trends in content marketing that you can incorporate into your plan. The biggest ones are social media marketing and mobile adaptation. Make sure you have an established Facebook, Twitter and LinkedIn profiles and that your website is mobile responsive. Another useful strategy is location based marketing. Include your location in the headings of your website and on your social media pages to optimize SEO and reach a close geographic audience. Website content refers to the pages that make up your website (Wuebben 84). The most important tool you can use here is SEO (Search Engine Optimization). SEO is essentially how your site ranks against all like content on search engines. Home page: This page should have a good balance of copy and design. Your website copy acts as a “virtual salesman” for you (Weubben 86). You need to constantly update and optimize your website content in order to continue to attract the right customers. It’s important to strike a good balance between having enough content to rank for SEO and not using too much copy on one page. The phrases used on your home page should be concise and unique Remember that your website should also be attractive and easy to navigate so people want to continue exploring it. No one wants paragraphs of information thrown at them all at once. Make sure to include related pictures and your logo. Services page: On this page, you’ll want to be specific about what your firm offers and who your key customers are without giving away too much information. You want potential customers to contact you, but also to be sure that they won’t be wasting their time (Weubben 92). Point out the ways in which your company is unique and focus on key words that you’d like to be associated with. Contact page: This is especially if you’re looking to market locally (Weubben 84). Good ways to optimize this page includes using Google maps, linking and tagging key words and phrases, such as your city and state. You should also make it very clear how you’d like to be contacted. This can include a phone number, form, email or social media profiles. Just make sure you’re easily accessible in case customers want more information. Another type of important web content is lead generation content. Examples of this for financial advisors could be e-books and article content. Having an e-book written by one of your advisors or quality articles makes you seem like more of an expert in your industry, drawing clients in (Wuebben 107). Creating easily shared content: One way to accomplish this is through “link baiting” (Weubben 136). This means making sure people are linking to your blog, liking your social pages and republishing your articles and blog posts. This keeps potential clients interested and interactive. It’s important to remember that your blog can also be a way to spread information on social media. This means your posts need to be compelling and well-written (Weubben 131). Start with an attention grabbing title and opening. You should also try to keep the tone light and conversational so people feel like they can relate, but also consistent with your company’s voice (Wuebben 157). 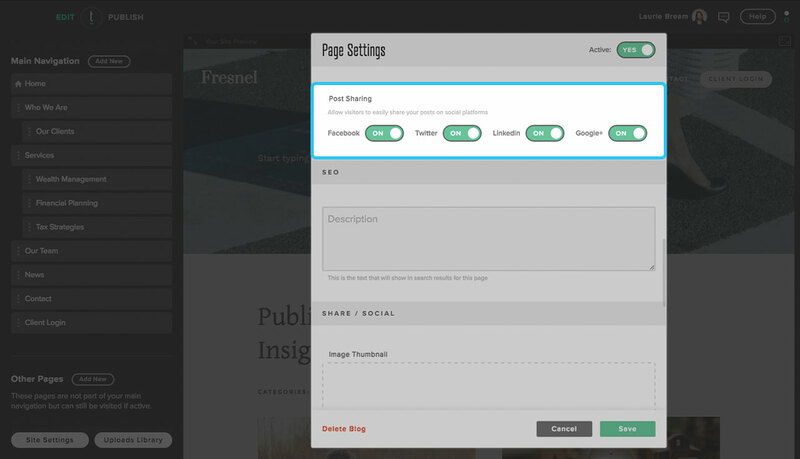 Include buttons on your blog posts that make them easy to share on social media. The Twenty Over Ten platform allows users to easily set their page settings to allow/disallow social sharing for viewers. Share other people’s content: This helps you build relationships in the social media world, which can help gain interest in your pages. Be consistent with commenting on posts you like, tagging other pages and sharing third-party content that your readers may benefit from. This can help you be even more of a resource. Because social media is such a common way for companies to market now, it is even more important to follow these guidelines so your social channels stand out (Wuebben 132). This is another way to become a leader in your industry and become a reliable resource when people come looking for information. If you’re struggling to find time to update your social media, check out sites like Hootsuite, which will allow you to load in content to be published at a later date. Lastly, audio content is becoming a popular way to stand out in the social media world. If you have the time and interest, podcasts can be a great way to reach out to customers in a unique way. Podcasting: You can either create these yourself or use an automated website such as PodOmatic or Hipcast (Wuebben 202). A great idea for financial advisors is to do these in mini series focused on one subject such as retirement or saving for college. This can give you a following from those interested in learning more and help you build relationships. These should be fairly short (about 30-60 minutes) and straightforward in terms of content (Wuebben 206). 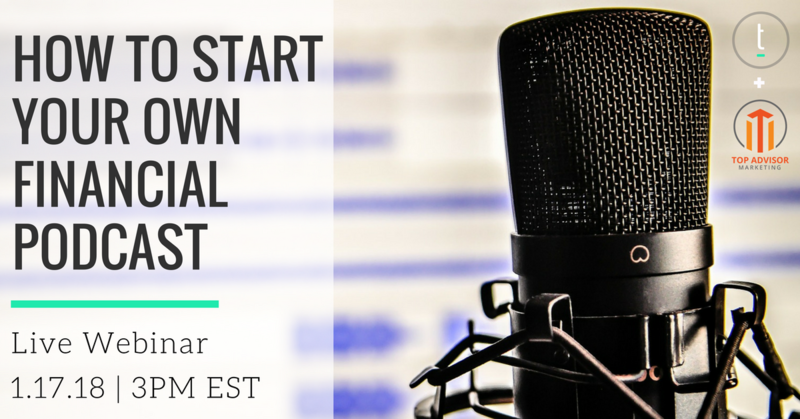 Interested in learning more about how to start your own financial podcast? Click the image above to register for our FREE webinar with Top Advisor Marketing! After considering these points, you should be getting a much firmer grasp on content marketing and how useful it can be for your firm. By focusing on establishing a long-lasting and trusting relationship with prospective clients and promoting a consistent, authentic online brand, content marketing can take your firm to the next level! Wuebben, Jon. Content Is Currency: Developing Powerful Content for Web and Mobile. Nicholas Brealey Publishing, 2012.